Thank you all for your support and encouragement when I launched my first ebook on Monday! An extra big thank you to those who supported me by sharing the post or buying a copy even though they aren't pregnant. I really appreciate it, the book took me a while to write and edit and I was so excited to share with you. Shea was kind enough to say some lovely things about it in her latest post too! Now, part two of the post I made last week, showing another two ways to wear graphic tees. This time around I'm wearing two of my Kisschasy band tees with maxi skirts. Something different from the usual graphic tee and jeans outfit, but just as easy to wear. Of all the Kisschasy band tees I have, this one has to be my favourite. Which is kind of funny as I missed most of the show on the Bones & Skin tour. The scary at the time (but funny afterwards) story of how we ended up spending most of the gig in a hospital waiting room will mean it's one of the more memorable shows despite only seeing a little part of it. Wore this for a quiet Saturday running a few errands. The chambray maxi skirt is only slightly different from wearing this band tee with jeans, but I feel it's a very different look. Comfortable and perfect for a day running around with the boys. Also pleased how perfectly the graphic print lined up with the elasticated waist on the maxi skirt! Last worn: Ray-Ban Wayfarer, Kisschasy band tee, chambray maxi skirt, gold Havaianas, plum Rebecca Minkoff mini MAB tote. Other ways to wear: Kisschasy band tee and leopard print jeans, chambray maxi skirt and stripes, plum Rebecca Minkoff mini MAB tote and denim shorts. Perfect for pregnancy: Rebecca Minkoff mini MAB tote and maternity denim. Another day, another Kisschasy band tee. This was actually the first graphic tee I got out of my wardrobe to wear after being inspired by Sheila's graphic tee outfit. I have only worn this tee a few times, as I got it when I went to the final Brisbane show before Kisschasy disbanded. While this tee does look great with jeans (and I've worn in that way in the past) for something different I went with a trusty wardrobe staple, a maxi skirt. I wanted to be comfortable for a trip down the coast to spend some time with my parents, and this was the perfect outfit for that. Last worn: Ray-Ban Wayfarer (above), Kisschasy Final Roar concert tee, stripe maxi skirt, gold Havaianas (above), Rebecca Minkoff purple mini MAB Tote bag (above). Other ways to wear: Kisschasy Final Roar concert tee and jeans, navy maxi skirt and yellow bag, gold Havaianas (above), Rebecca Minkoff purple mini MAB Tote bag and skinny jeans. Perfect for pregnancy: Kisschasy Final Roar concert tee in second trimester, purple mini MAB tote bag with pink dress in second trimester. You don't need to leave all your old concert or band tees to gather dust in your wardrobe! Try pairing them with a maxi skirt for a different look. This works well with any graphic tee you'd usually just pair with jeans, but is just as easy and comfortable to wear. Linking up with Hello Monday, On Monday We Link Up, Shoe & Tell, How I Summer, Monday Mode. I love the bag, it is so pretty! Great looks and congrats on your ebook!! That is so exciting!! Oh, I need to try that! I have a few graphic tees and get bored by only pairing them with denim. Loving that first skirt- also I seem to have missed the ebook announcement- will go check it out. Congrats! First, congrats to launching an e-book. I will definitely check it out. That is so amazing and I can not wait to read it! Second, I love your look. You look stunning. Really nice graphic tee especially the first one, I like how you styled it with light blue maxi skirt. I jst love that shoulder bag. The colour of it is amazing. Great post. Oh I love the combo of the graphic tee with a maxi skirt! It adds such a fun, casual vibe. I've never heard of that band, what kind of music do they play? I really enjoyed your big comment from yesterday, Mica, thank you! I like the idea of you doing a denim-free break - I think it will be a good challenge for you! I love that denim skirt in the first outfit! It's just lovely. Never heard of Kisschasy - must check them out. Congrats on your eBook! So exciting! Thanks Sheila! I've been doing my own little version of the challenge for a while and it's not as hard as I thought! Hi! Congratulations!! That's so exciting! I absolutely adore both looks! Thanks for the inspiration always! I love that first look. So fresh and easy to wear! Band tees are the best. They can go with so many outfits! I love it paired with the maxi! Graphic tee and maxi skirt is a combo that I never thought would go together but you look great in the combo! I'll definitely give it a try so thank you for the inspiration! I love band tees! I have a Rolling Stones & Duran Duran tee. I wear them all the time. Love yours Mica! Loving the band tees with the maxi skirts! And of course the Rebecca Minkoff bag! Kisschasy was a great band - and certainly a memorable night at their gig!! 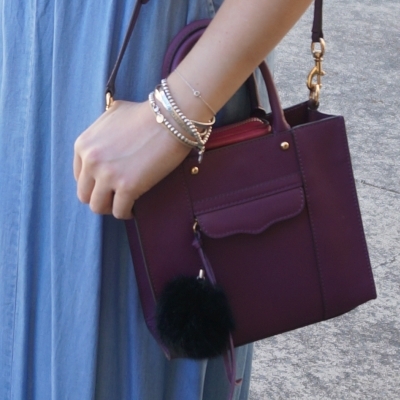 Love these pairings and the purple bag! Ohhh I'm a fan of maxis too! So easy to style and you can almost pair it with any top! I might need to take your advice, it looks great! I forgot all about the band kisschassy haha! I love the band tshirt / long skirt combo and you look amazing! That purple bag is so cute too! haha making me feel old! Soundtrack to my student days! I need to do a graphic tee and a skirt stat! Thanks for the reminder! That chambray skirt is beautiful! And I'm crushing on your plum mini MAB! How pretty!! Your graphic t-shirt looks great with your stripe maxi! That first light blue maxi is so pretty and it looks great on you...both outfits are very stylish, but the first one is my fav. I love how graphic tees make anything casual. These two graphic tees are fabulous and I love how they look with maxi skirts! You're actually making me wonder where my concert/bands tee shirts went ?!?! You are the queen of maxi skirts, Mica! You pull them off so well and I love how you styled this band tee with them! Thanks for linking up with us!!! Definitely - it will always be a memorable gig! 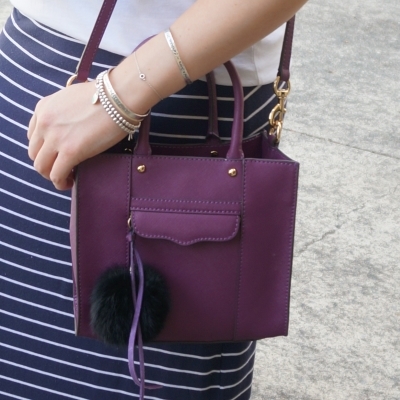 Love the purple handbag! Nice additive to the outfit!